The UK and the US shared common strategic interests in the region, but their analyses and policies were not identical and there were important differences in their tactical and diplomatic approaches’. (Chilcot Report on the Iraq enquiry, vol. I, p. 24). The announcement sixty years ago today by President Gamal Abdel Nasser that he was taking the Suez Canal into Egyptian ownership provided the ‘inciting incident’, as screenwriters say, for a crisis that still haunts British politics. Enraged by Nasser’s defiance, fearful the Canal would be closed to British oil supplies, frustrated by the slow response of the military and intelligence organisations, thwarted by international politics, the British Government embarked with France and Israel on a flawed plan to force Nasser’s capitulation and Egyptian regime change that ended not just in failure but−for Prime Minister Anthony Eden in particular−in humiliation and loss of office. But why did Nasser’s announcement have such a profound and far-reaching effect? The context reveals a series of preconceptions and misperceptions, particularly on the part of the British and American Governments. Existential threat, neo-colonialism or regional power play? Britain’s response to the nationalisation of the Canal was based on deep-rooted preconceptions that by 1956 were increasingly open to challenge. The Middle East was seen as a strategic land bridge between Europe, Asia and Africa and key to British security, particularly in the Cold War context of the Soviet Union’s regional ambitions. 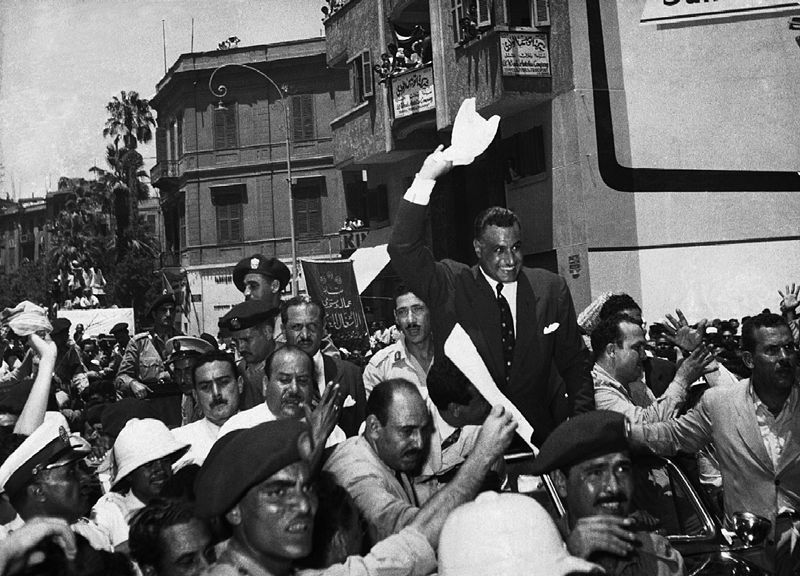 Nasser’s actions and orchestration of anti-British agitation throughout the Arab world and beyond threatened what was seen as an accepted position of authority for Britain in Egypt. Foreign Secretary Selwyn Lloyd, after meeting Nasser in March 1956, told the Cabinet the Egyptian leader would not work with the West or promote an Arab-Israeli settlement, and Britain should realign its policy accordingly. Britain’s oil supplies and trade routes to the southern hemisphere and Far East depended on free passage of the Canal; the British did not believe Egypt capable of running the Canal unaided, nor that it would be kept open to international traffic. Nasser’s announcement on 26 July seemed to pose an existential threat. The British Government’s misperception was that a shared Anglo-American belief that the Soviet Union was opening up a Cold War front in the Middle East meant agreement on regional policy. Some in Britain, looking back to wartime liaison and to the unseating of Mossadeq in 1953, assumed that the Americans, too, wanted a more cooperative partner than Nasser, and saw Arab insurgent nationalism as a threat. But the US Government thought Britain and France were motivated by colonialism, and President Eisenhower declared he was ‘determined not to have the United States used as a cat’s paw to protect British oil interests’. The US did not rely on the Suez Canal for oil supplies, and was prepared to believe Egypt could run it and would keep it open. Arab nationalism was seen as a healthy anti-imperialist activity, and the nationalisation of the Canal a natural demonstration of it (to British irritation, the US did not extend the same attitude to its own activities in South-East Asia). Withdrawing funding from the Aswan Dam was motivated in part by domestic considerations in a Presidential election year. Though alienated by Nasser’s arms deal with Czechoslovakia and recognition of Communist China, the Americans still thought it better to keep him in power as a bulwark against the USSR. The poor relationship between Eden and US Secretary of State Dulles, who thought Britain was in decline and seeking to restore its imperial status, made things worse. For the US, Anglo-French ‘neo-colonialism’ was not only self-deluding but a threat to American commerce. US intelligence, close to Nasser, thought the Egyptian leader was ‘a master of our kind of game’; British intelligence, under-resourced in the region and suffering from a series of spy scandals, did not have the same access nor share US insights. The British, thought CIA officer Miles Copeland, believed they ‘should get rid of Nasser, hang the practical consequences, just to show the world that an upstart like him couldn’t get away with so ostentatiously twisting the lion’s tail’. And yet the US understanding of Nasser’s position and policies player was in itself a misperception. It underestimated Nasser’s ambitions as leader of the Arab world, the extent of his relations with Moscow and the implications of Arab nationalism for the stability of the region, for Egypt’s relations with the US and for the prospects of an Arab-Israeli peace process. Nasser was indeed a game player, but the rules by which he played were understood better in Jerusalem, Khartoum, Moscow or Riyadh than they were in London and Washington. The Egyptian leader displayed the most realistic appreciation of the situation. Though he framed Canal nationalisation as a direct response to the US decision to withdraw funding for the projected Aswan Dam, it had clearly been in preparation for some time. The wealthy, Anglo-French Suez Canal Company’s control over a waterway that ran through Egyptian territory and employed many Egyptians was an obvious focus for nationalist agitation. Since 1954 the Egyptian Government had presented the Company with a series of demands aimed at undermining its position. Egyptian technicians, many Soviet-trained, could run the Canal and keep it open to international traffic. Taking over the Canal would serve the dual purpose of increasing revenues and demonstrating Egypt’s defiance of Western ‘imperialism’. It would also strengthen Nasser’s hand against internal dissent, particularly from the powerful Moslem Brotherhood. At the same time, Nasser understood Egypt’s pivotal position in Cold War politics. He knew the Soviet Union was interested in extending influence in the region, not in direct aggression, but that both Britain and the US feared the Russians sought to open a new Cold War front in the Middle East. He knew the Americans hoped he would focus Arab opposition to Soviet ambitions. He knew the British disliked him but were over-committed militarily in the region at a time when Israel (supplied with arms by France) was threatening their treaty partner, Jordan. Gill Bennett will be taking part in Staging Suez: the 60th anniversary of the Suez Crisis at The National Theatre on Tuesday 1 November.